Gold-dusted nutrition bombs. That’s what you need to know. These mushrooms. They’re stuffed! They’re vegan! They’re gluten-free! 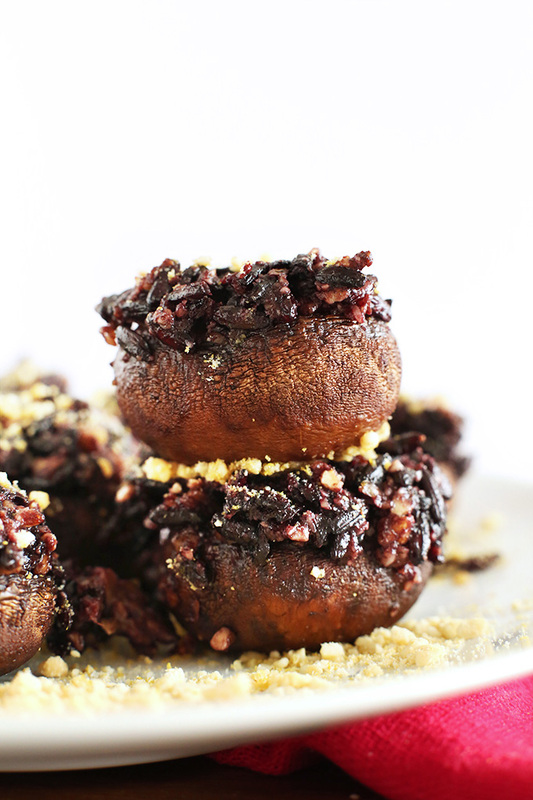 They require 7 ingredients, and they’re SUPER yummy. I mean, come on. Anything with vegan parmesan gets 5 gold stars in my book. 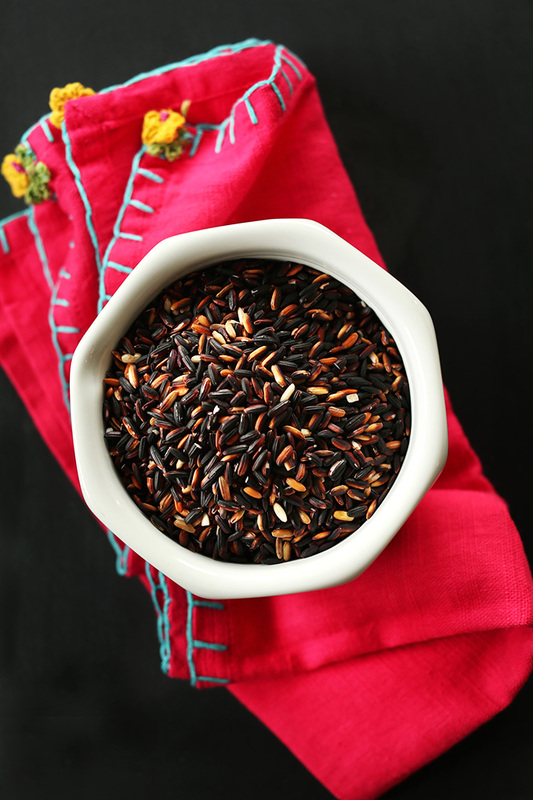 It all starts with black rice, the nutritional superstar that boasts more anthocyanin antioxidants than blueberries, and is loaded with iron and fiber. Hubba, hubba. Next comes walnuts, and we all know how high in healthy fats and protein and omega-3s they are. I try to eat a few every day! 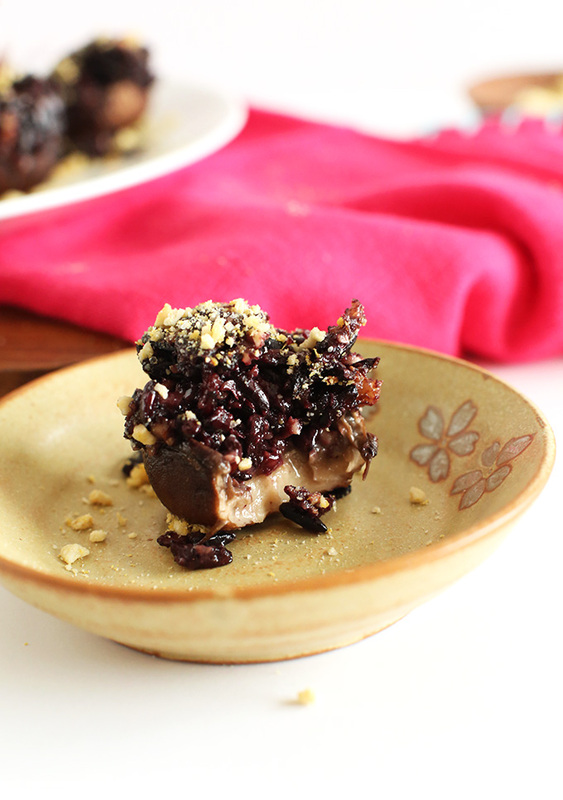 Plus, they add a nutty, hearty bite to the black-rice filling. And last but not least, vegan parmesan, which acts as a salty, “cheesy,” (secretly healthy) topping, and crust that sends the flavor of these babies over the top. So what do they taste like? Let me tell you. They’re: Tender with a slight bite Warm Savory Hearty Slightly nutty Mega healthy Light Satisfying Highly shareable And altogether lovely Invite your friends over for drinks and appetizers and prepare to watch these mushrooms disappear. So, dang, delicious. Enjoy! 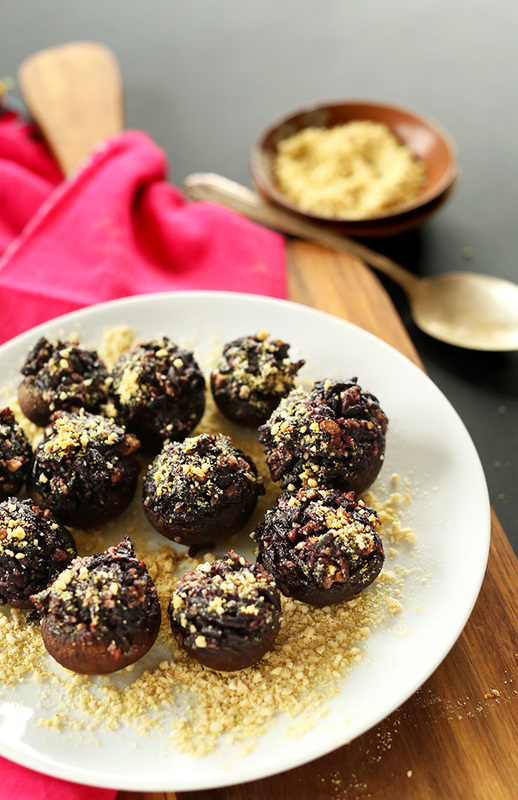 Simple, savory 7 ingredient stuffed mushrooms topped with a black rice-walnut filling and vegan parmesan cheese! Preheat oven to 350 degrees F (176 C) and rinse rice in a fine mesh strainer. Bring veggie stock to a boil in a small saucepan, then add rice. Lower heat, cover and cook until liquid is completely absorbed – anywhere from 30-45 minutes. Taste to sample doneness – if you prefer a chewier, softer rice, cook longer. If you’re OK with more bite, check around the 25-minute mark. In the meantime, place walnuts on a baking sheet and toast in oven for 5 minutes. Set aside. 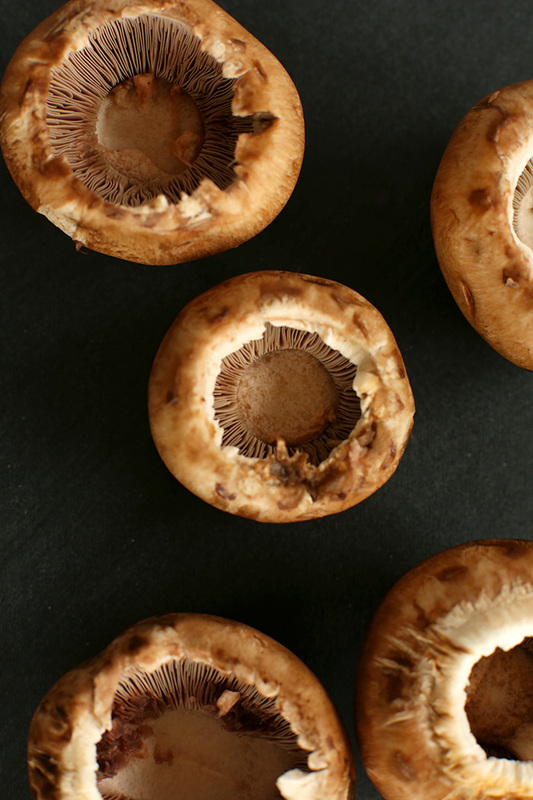 Brush dirt from mushrooms using a damp towel and remove stems. Brush or spray with olive oil and set aside. Prepare parmesan cheese if needed. Set aside. Once rice is done, fluff and then add vegan parmesan cheese, toasted walnuts, minced garlic and olive oil. Stir, taste and adjust seasonings as needed. I added just a pinch of salt and pepper and a little more vegan parmesan. 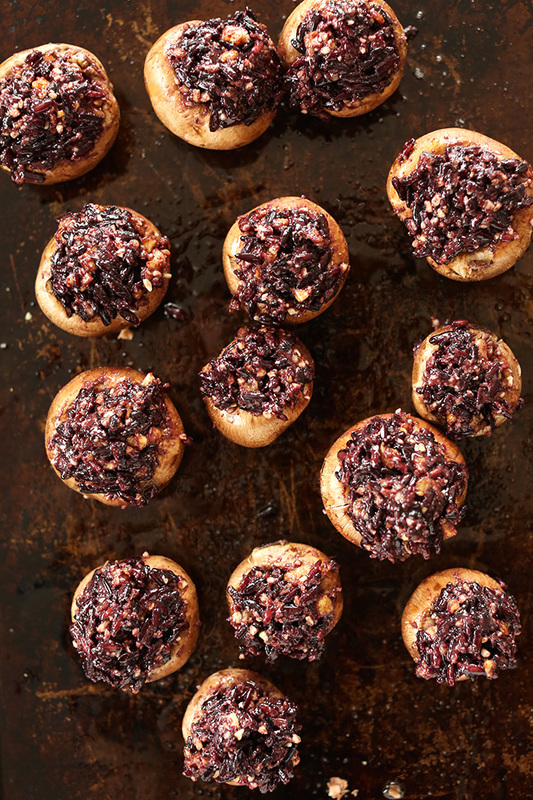 Bake the mushrooms on a baking sheet WITHOUT the filling for 10 minutes to soften. Serve immediately. 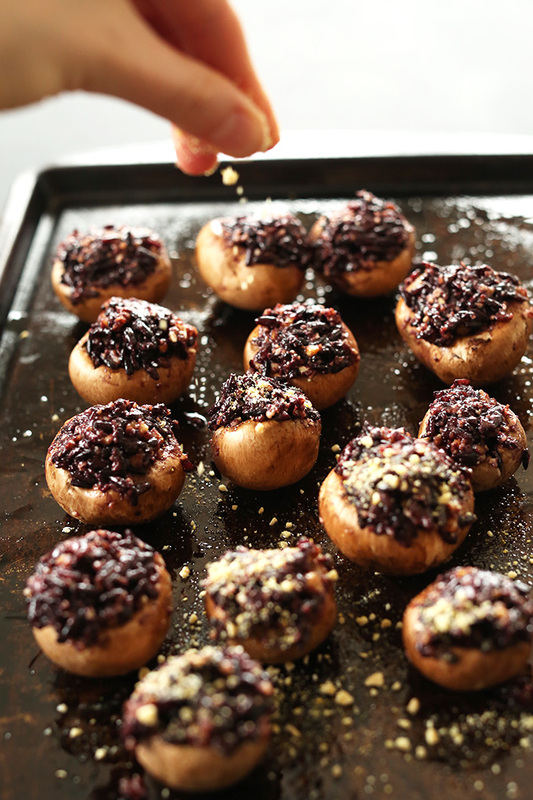 TIP: Dust your serving plate with vegan parmesan cheese so the bottom of the mushrooms have plenty of flavor, too. Delicious. Got off work and an hour and a half later, finished eating this. Used 2 big Portobello mushrooms, so there is one for tomorrow too. OMG! This was fantastic. My meat loving husband couldn’t get enough and truly was surprised by the amount of flavor a vegan entree could have. He asked for repeats. I made these and they turned out great. I will be making this up again. Yum! We’ll have to give these a try. Can’t get vegan Parmesan cheese without plastic packaging where we live, so we might substitute with some nutritional yeast. Thanks for the recipe, they look delicious! These were delightful. Very filling as well. I will make them again for sure. I am going to freeze some filling so I can have them for a quick dinner when needed. Not at all vegan, but my girlfriend is. We cooked these together and they were amazing!! Hi Dana! Do you think I could prepare this as an appetizer the day before and serve it a day later and they will still be good? Thank you for your help! Yes, you could but they are best fresh! I absolutely love this cheese and sooooo many more of your recipes. They are all delicious and easy to make. Thank you so much for sharing all the goodness! You make vegan cooking So good, easy, and healthy! Thank you so much!!! These are divine! I used a taco walnut mix I had left over… so good! Thanks for the recipe! This was excellent! Though I should have coated the mushrooms in an oil or marinade. My favorite part might have been eating the leftover stuffing alongside the “mushroom medley” (frozen section) from Trader Joe’s. This might become a standing meal, or at least one always on hand since no perishables are required! I’m making these for a party! They look relish! Would it be ok to completely prepare and assemble them except for the final baking? Then they sit a few hours until I’m ready. Then do the final 18 mins before serving? I’ve been vegan for over a year now and your blog is one of the reasons I’ve found it so easy! Thank you so much for all your consistently delicious recipes. No joke – I’ve recommended your site to almost everyone I know. Your vegan parmesan recipe might have changed me life, ha. Just tried this recipe tonight and, as per usual, it was easy to put together and very tasty. My non-vegan mom loved it too, which is always a plus :) Thanks for what you do! when you say 1/2 cup of rice, do you mean cooked or raw? thanks! I am hoping to make these tomorrow! Raw + refer to step 6! I am a carnivore but looking into more non meat alternatives and a few friends had our first monthly Sunday lunch of alternative foods. We have gluten free, egg free, and nightshade free members. These mushrooms were a winner. The vegan parmesan is brilliant. I would make for anyone!!!! Just wondering what your instructions and cooking time would be if preparing these one day ahead for a cocktail party. Thanks so much! This is sooooooo good! Simple and easy to make and flavorful! I will definitely make this again! meals for her that we both can enjoy. I made these mushrooms for her, but couldn’t leave them alone. They’re absolutely delicious. All ingredients balance out perfectly. I added just a bit more fresh garlic, and a bit of toasted sesame oil. They Rock ! Making them again tonight. These were easy and delicious. They were a big hit at a recent dinner party with mostly non-vegans. Soooooooo, I just made these and they look exactly like picture and taste awesome!!!! Very easy. I made a trial batch before I bring these to Thanksgiving dinner, and will be happy to share (the next batch) with everyone! Left out the nuts because a relative has allergies. Please tell me how you prepared them ahead to take to your party. Thanks! Just made these today and loved them. Would love to share a photo…not sure how to though. Anything with nutritional yeast makes me happy and the many textures and all around presentation of these little gems makes them keepers in my book. Thanks as always for inspiring us fellow vegan foodies. Just made these and they are delish! I chopped the stems and put them in with extra rice. peas and the vegan parm and made a side dish for tomorrow! I just got your cookbook and bought everything for the first week. I am going to have my daughter photograph the recipes because I bought her your food photography course! She is 17 and loves to take pictures of her food! Thanks for all your great recipes with minimal ingredients. I am all about that! Your so welcome! Made the Chili with cornbread and the ciabatta pizzas! Made vegan versions and used the vegan Parmesan cheese. They were great! Tomorrow is the salad with adobo dressing. Awesome recipe, no leftovers! Delicious and recommended. Made these today. Eliminated oil, used 1 1/2 tsp flax meal mixed with 1 1/2 tbsp water. 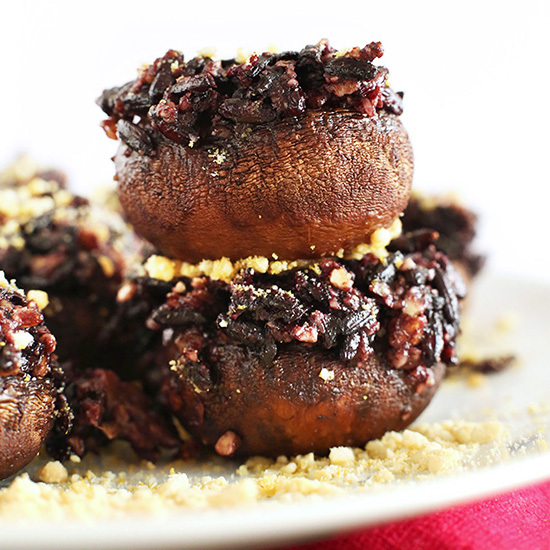 Stuffed large mushrooms. Absolutely delicious! Will definitely cook and devour again! Thank you. I made these last night with wild rice and they were really, really good. Thanks for the recipe. I’m making this recipe today with chicken stock since I’m not vegan and thought I would chop the mushroom stems and add to the rice stuffing. Thank you for the recipe! Was thinking something drizzled over the top before serving might be nice too…hmmm? I’ve never pre baked my stuffed mushrooms…just pulled them out of the oven and each mushroom is filled with water (so cute), I think I’ll dump it right into the rice not to waste the flavor. Just made these for dinner and they were delicious! Used farro instead of black rice since it’s what I had in the house. Will definitely make again! Wonderful news. Thanks for sharing, Adena! I just made the mushrooms and they are super delicious. I just couldn’t find any parmesan, they taste well without too. Very tasty! I used wild rice, and had to add a lot more water than you recommended, but I really like this recipe. I also made the mistake of leaving them in the oven too long…the mushrooms got nice and juicy, but the rice was a bit too crispy. Even so, these were the first things to be totally devoured at my family chirstmakah gathering! I completely forgot to add cashews to the veg parmesan, and just mixed the nut. yeast, garlic powder and salt…and i was still amazing! Next time I won’t be a dolt and will use the cashews too. I would definitely make these again (Probably soon as I ended up w leftover stuffing despite doubling the amnt of button mushrooms. Thanks! Tess: you must have used the wrong kind of mushrooms. Hmm, I think so! If you decide to try it, let me know! Made it for dinner along with roasted sweet potato… Used pecans instead of walnuts and real Parmesan because those were what I had on hand. Used full portobello mushroom caps and it turned out great! I doubled the filling recipe and had extra which my kids happily ate on its own. :-) thanks for the great recipes!! Yay! Glad it worked out so well. Thanks for sharing, Cara! Wow, Dana! These mushrooms look INCREDIBLE. 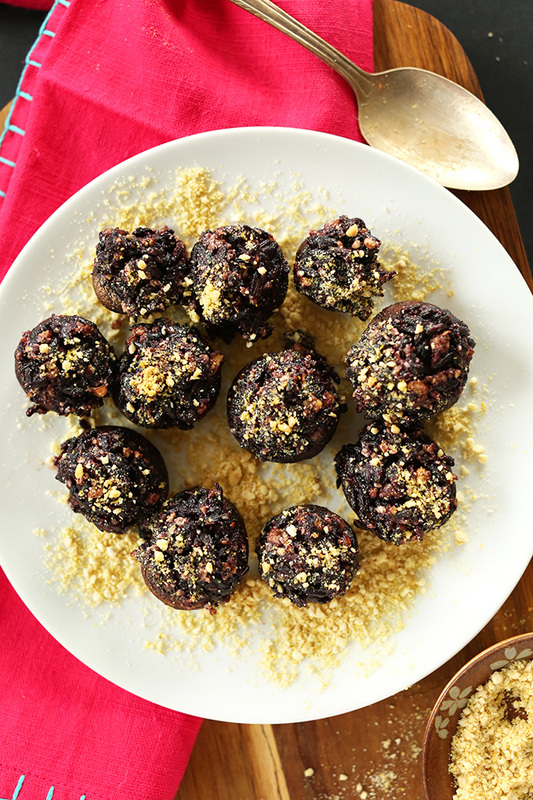 I’ve always loved stuffed mushrooms (although I’ve only really liked the stuffing part) and I love how healthy and wholesome these are. Perfect! I’m definitely going to have to try these. 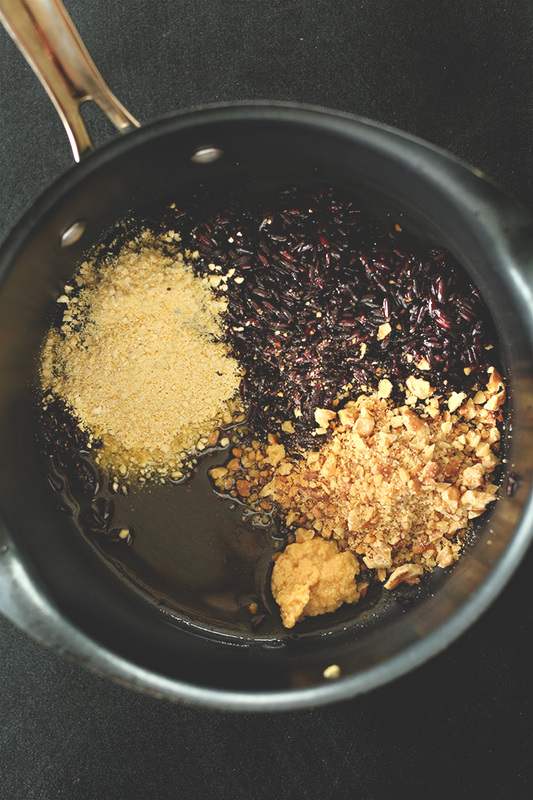 Great recipe, love black rice! Woah, vegan parmesan – amazing. I love black rice too! Why not stuff them with gold dust and top them with rice(just joking)? Mushrooms always look so “weird” but there a beautiful fungus with tremendous healing powers….I always wanted to study them at Bastyr University in sub-clinical studies on turkey tail fungus(one day I will)…. Have a hippy day you too…One Love…. Thanks Averie! Mushrooms hold a special place in my heart, especially when I’m craving something “meaty” without the meat! I absolutely love mushrooms. I’ve never tried vegan stuffed before. This recipe looks awesome. I’m addicted to veggie parmesan! I’ve been throwing it on everything – literally just had a pita pizza (lazy I know, but so yum) covered in the stuff right now. 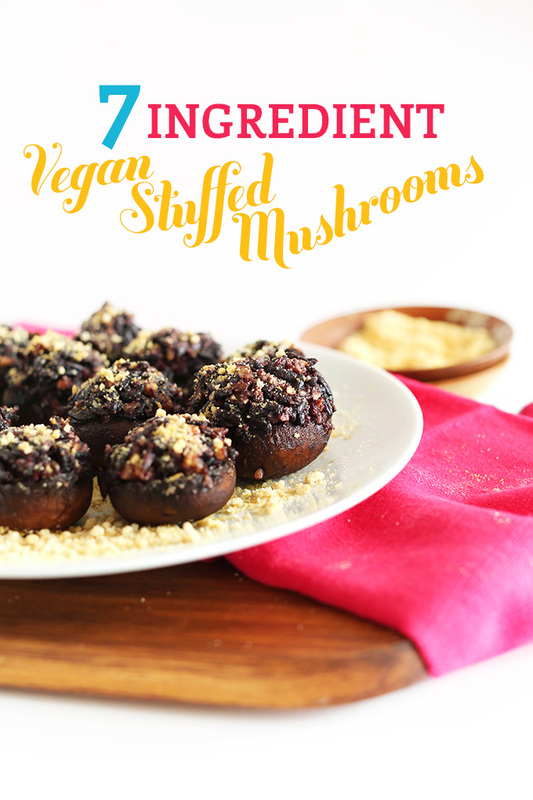 I used to love stuffed mushrooms before going vegan… these look as if they’re not going to miss the dairy a bit! Those just look amazing! Mushrooms are by far my daughter’s favorite food! Could nutritional yeast replace the vegan parmesan? It could, but it will not be as salty or have as much texture. haha, right? I’ve only tried it in the last month. SO good! Question for you – I am not a cheese fan at all (never liked the taste). Do you think I could get away with just skipping the parm? I have avoided nutritional yeast because I have read it tastes like cheese. I would love your thoughts! Thanks very much! It won’t be as flavorful or savory…you can still use nutritional yeast. It is “cheesy” but not overwhelming. Hope that helps! Love stuffed mushrooms! Never thought to make them vegan. Yum! Those mushrooms look so delicious! I can’t believe how good something healthy can be! MEEE TOOOO ;D Obsessed with that fairy dust gold! Ta-da! Those look great, and super simple. I OD’d on mushrooms a couple weeks back so I’ve been avoiding them… Maybe this’ll get me back into the swing with them. Thanks!